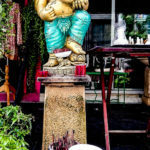 One of the biggest attraction of Singapore is Sentosa Island that is home to many attractions that one can enjoy with the family. No matter what you plan to do – from enjoying various slides and rides at Universal Studios, closely watching marine life at S.E.A Aquarium, to shopping for Singapore souvenirs and gift items you are spoilt for choices for family fun activities at Sentosa Island. 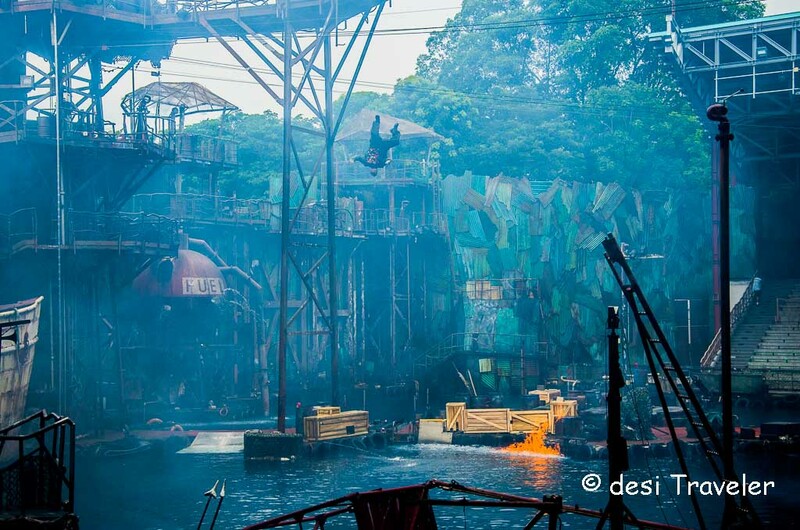 One of the major attractions of Universal Studios Singapore on Sentosa is the Waterworld live show at a specially made theater at Universal Studios. 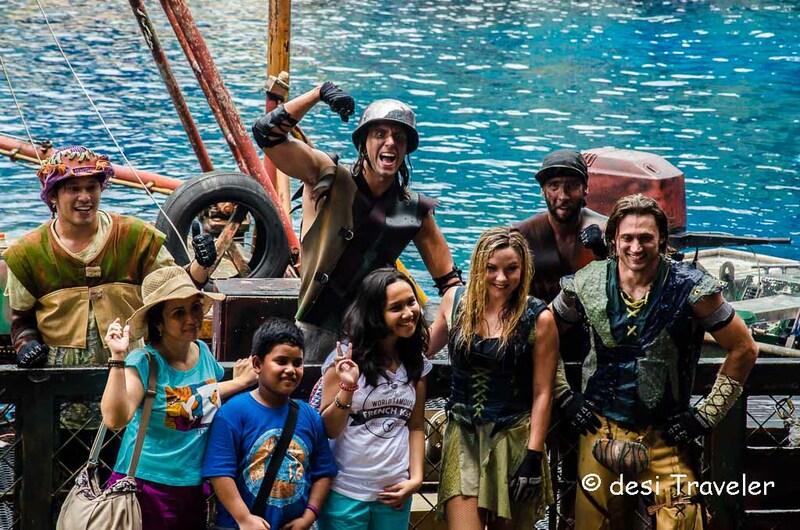 Based on Kevin Costner movie Waterworld, the show takes the story of the movie further but most of the characters etc. remain same. A little bit of history of the movie Waterworld here would not be out of place here. 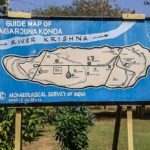 The movie takes you to the world where all the icecaps have melted and there is no land left except for some mythical place just known as Dry Land. Everybody wants to go there as it is the El Dorado of the post-apocalypse world. 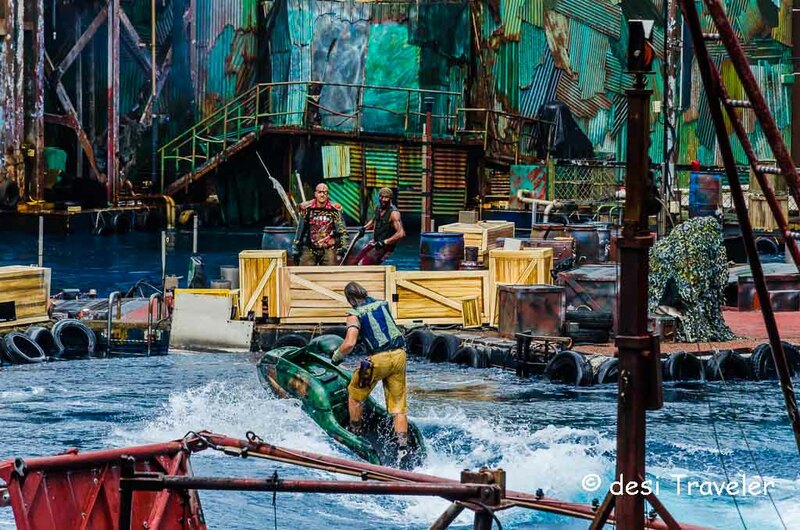 The beauty of the show is that you get to see the water world just like they showed in the movie. A very elaborate set with pulleys, water skis, airplanes ( yes Aeroplane ), etc. 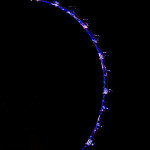 was created at the Singapore Universal Studios. There are daily two shows one around 1:30 and one around 4 pm every day. 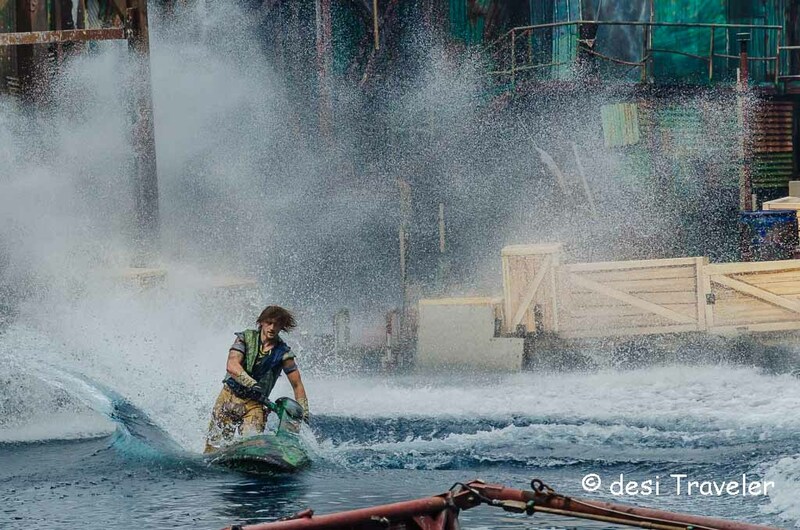 We watched the first show and the theater was almost Jam packed except for the front rows where you are splashed with water from the racing water skis. If you have watched the movie you must be aware of the story if you have not watched it let me summarize it. You are in the world where all snow on the poles and the Himalayas etc. has melted, the world has drowned and only a few people survive in makeshift enclaves in the ocean. But they all dream of dryland whose stories they have listened. Then the story is simple in the movie the bad guys kidnap the girl with the map, the hero ( Kevin Costner) saves here from the bad guys known as smokers. 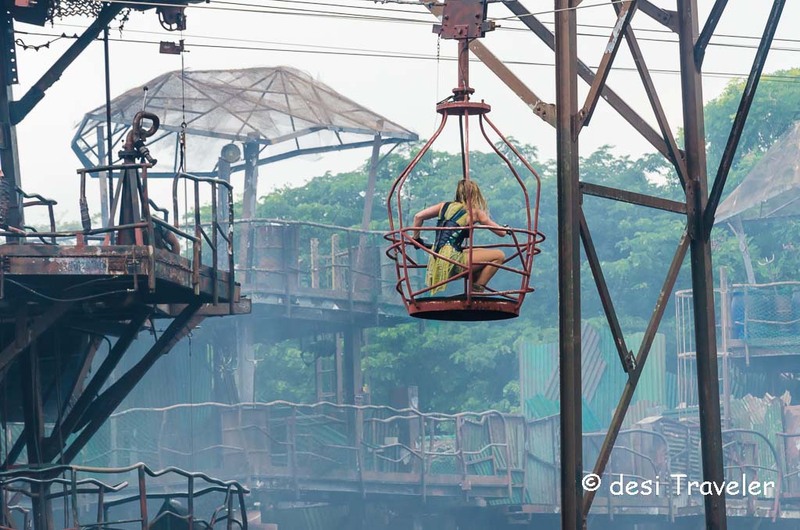 In the live show at Universal Studios Singapore, the story continues and the heroine has returned Atoll or their artificial floating island, or Atoll. The purpose of the return is to save her friends ( remember she is the heroine ). But the bad guys don’t want her to leave and then starts the fighting. This is where the show gets very interesting. 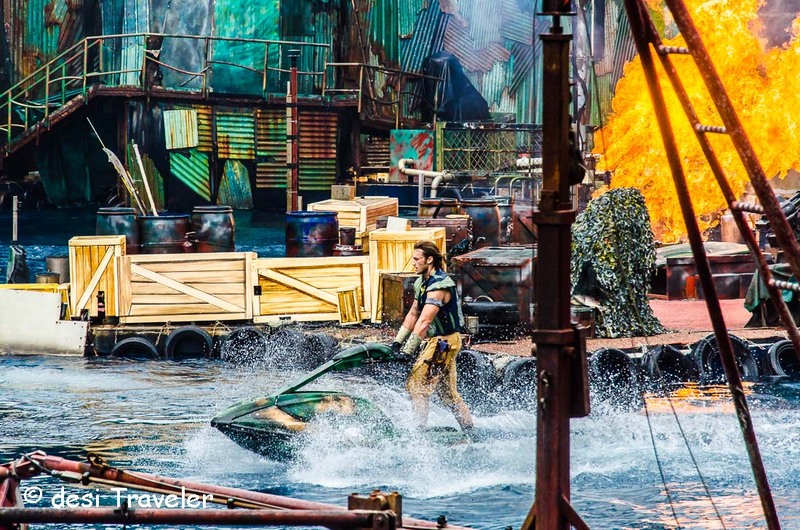 As you see in movies there is a lot of chase on the water skis and even hand to hand combat between the brave hero and the bad guys of the character played by Dennis Hopper in the movie Waterworld do not want her to leave as she knows the way to the dry land. Soon a chase begins and we hear bomb blasts, gun firing, smoke coming from the fire. The hero joins the fray and is captured, then escapes, the same thing happens with the heroine. 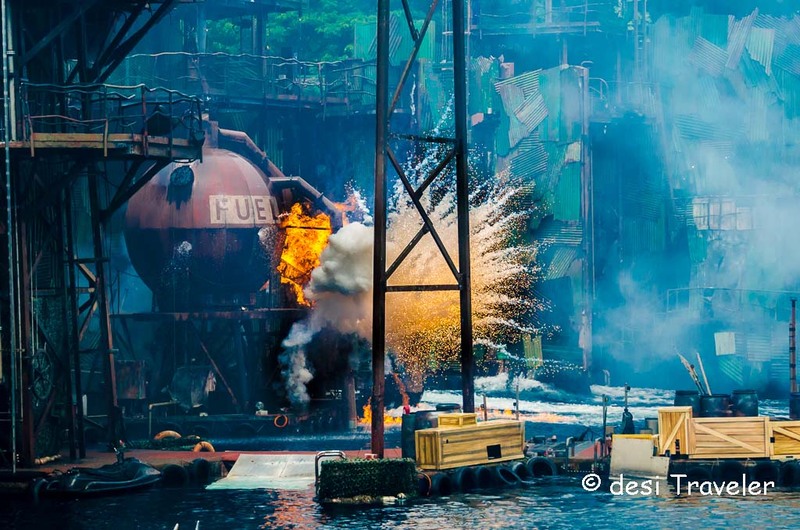 All this while some superbly coordinated real action in Waterworld happens in front of your eyes just like in the movies skis go under water only to emerge in the air, tanks explode and there is fire everywhere. One must salute the stunt director and the cast and crew of the show. 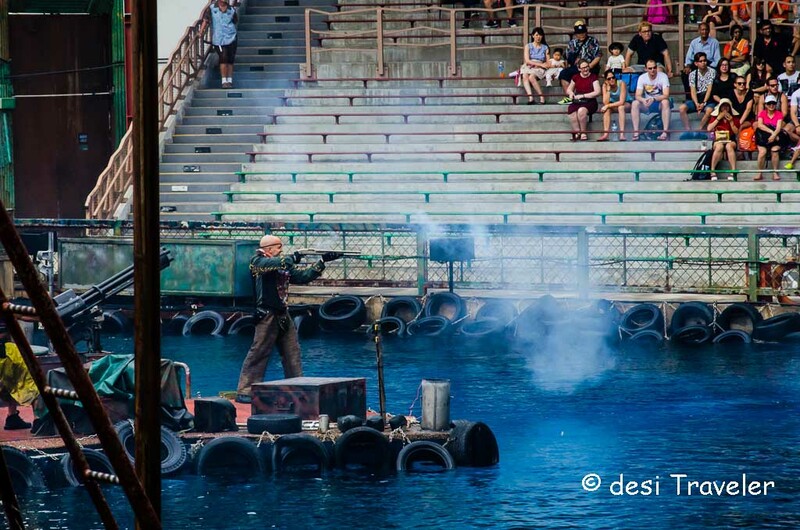 As they have a very small area to play around for a high-speed chase, jumping into water from the tower. 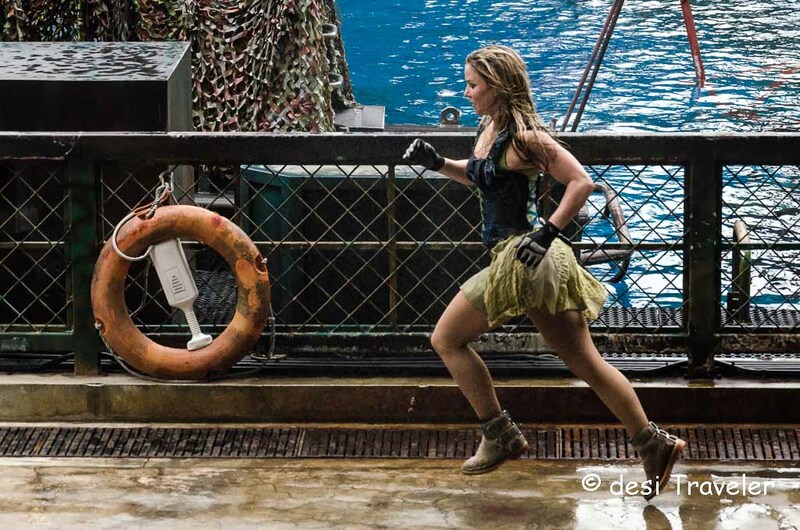 The heroine escapes from the cage and is chased across the Atoll. The hero is considered dead a few times but magically keeps on coming back. All this while some real high-speed action, combat, loud explosions etc. keep on happening. 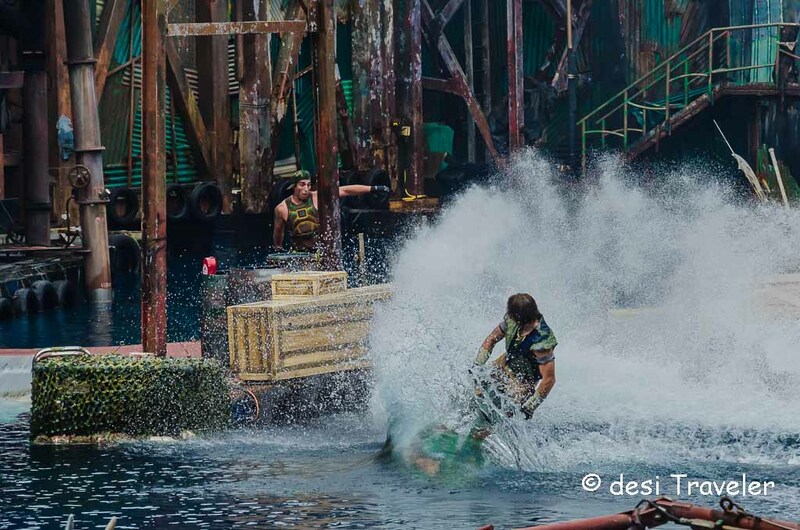 At times during the ski chase, huge splashes of water drench the audience sitting in the splash zone. As the characters pop in water from high-rise towers you wonder if there is ever a miss how much practice these actors must have done for such superb performance. The show lasts about 16 minutes and you hold tight your breath for that duration. 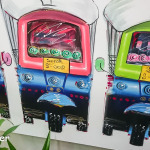 In the end, as always the good guys / good girl wins and the baddies are sent for recycling. The Hero and Heroine finally meet and just as they are getting busy a plane crashes on the set. Everybody panics only to realize that this is all part of the show. 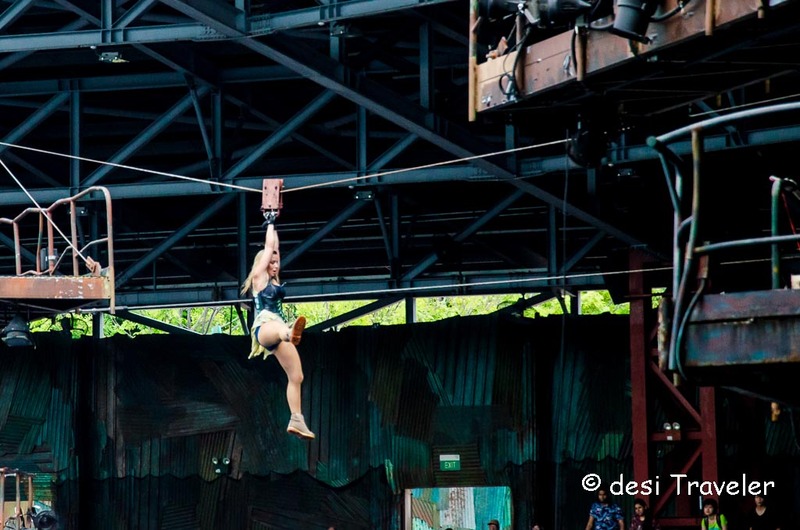 Now imagine such high-speed adrenaline rush moments and you marvel at the precision with which the actors do their job, not missing their part even once. At such high-speed chase, you need absolute precision, complete safety gear in place, and making sure that the actors are always out of the blast and fire just before it explodes. 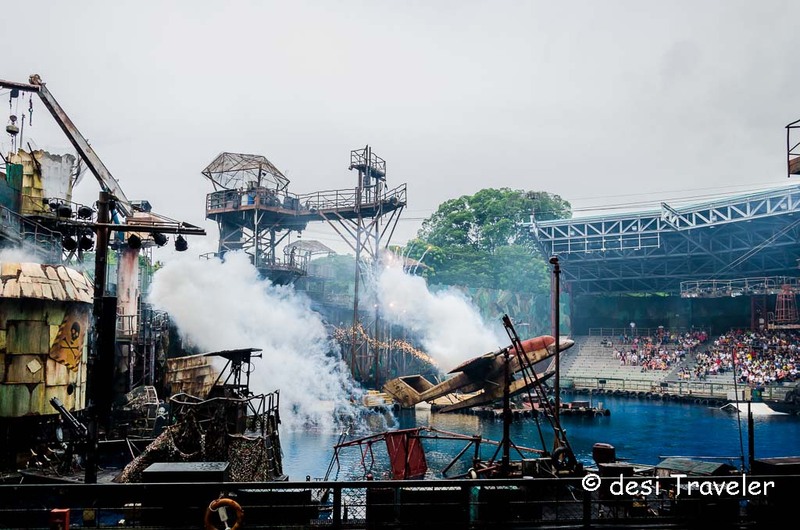 Still, it was hair-raising to see the characters jump into water through fire, and chase each other on water skis in the small set created for the purpose. All of us watched the show mesmerized, only blinking to click a picture or two. 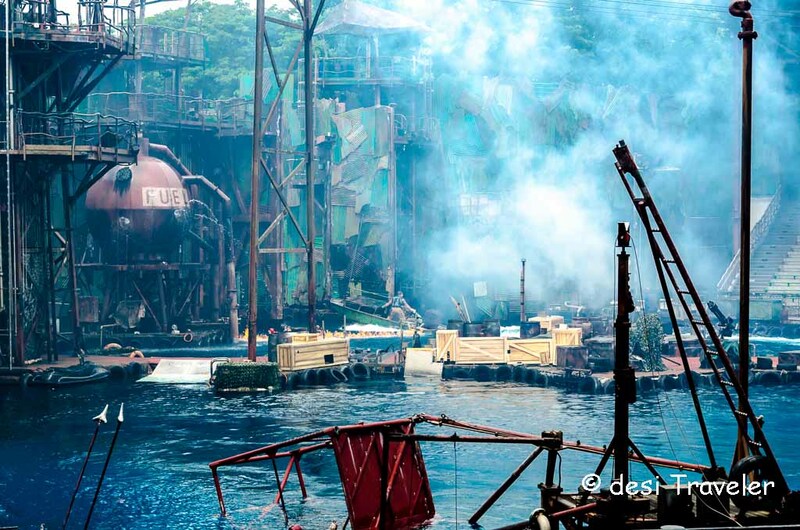 Some of these pictures of Water world show at Universal Studios I am sharing here for you. 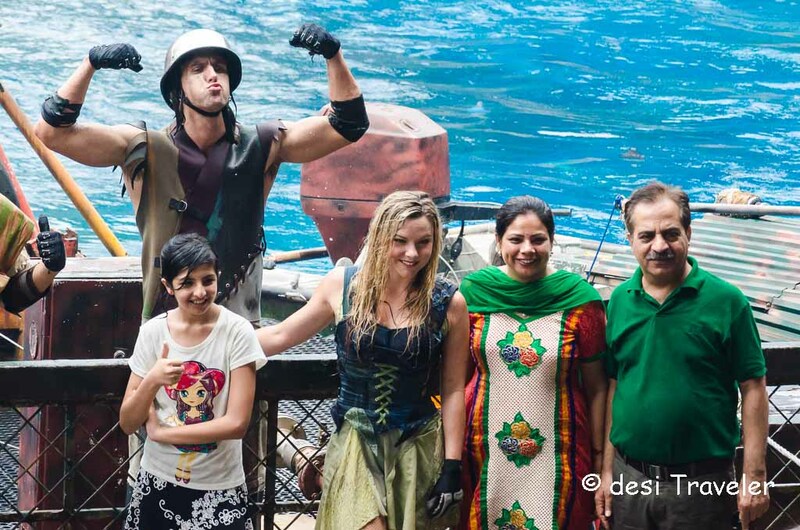 Some of the desi and other visitors to the show posed for pictures with the cast of Waterworld show making the families very happy. 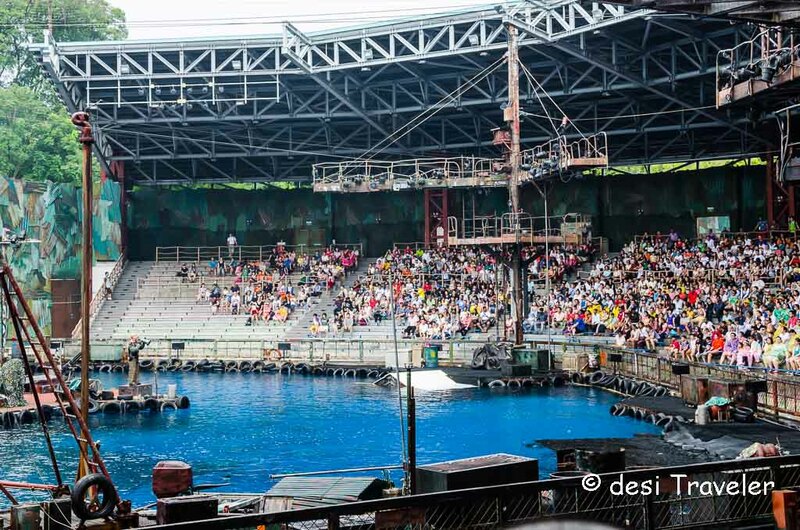 Once the show ends people start leaving the arena as the crew of the Water World show Singapore need to prepare the sets for the next batch of an audience. 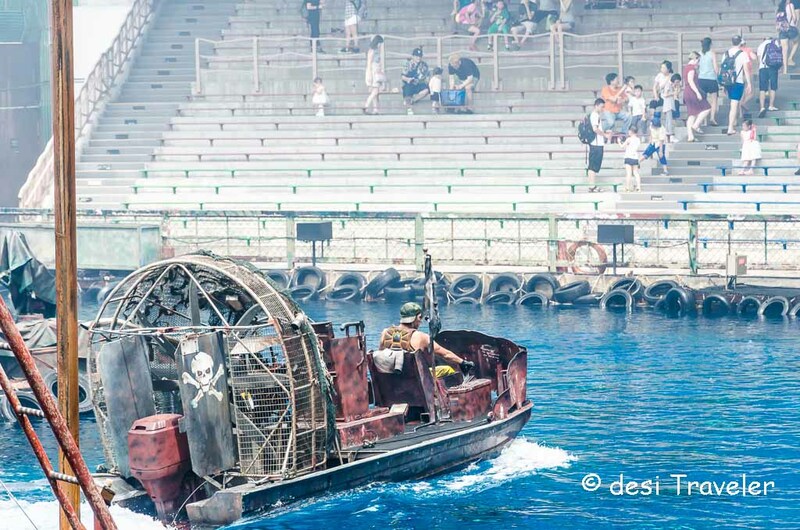 I would strongly recommend watching the Waterworld show at the Universal Studios Singapore. Make sure you arrive on time to not disturb the show as it happens at a very high-speed and nobody wants to miss the action. Almost a movie via images. Thanks for sharing bro.